A better debate on transport. The UK government is not investing more in transport in North England than London and the Wider South East. UK government transport investment per person in the four years from 2017/18 to 2020/21 would be higher for North England than South England. IPPR North’s work in previous years analysing the NICP had been “misleading” and “unofficial” and had “unduly influenced public debate”. The letter deserves a detailed response, so I have written one. There are seven parts, if you make it through them all I’ll buy you a pint. 1. Geography. Is Essex really in the Midlands? When discussing UK government transport investment The North is almost always referring to an imbalance between North England and either London alone, or London and The Wider South East. 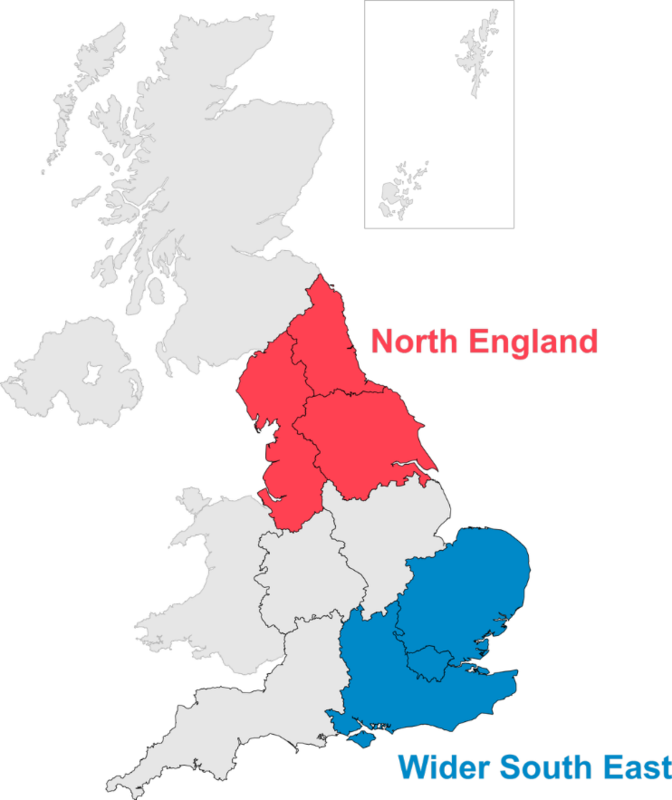 The Wider South East is East England and South-East England. For the rest of this piece I will use this definition. The letter creates a region called the “middle” of England. This is The Midlands plus East England. This is very unusual. Almost all definitions of South England include East England. Essex is in the South. This geography has obviously been created to take areas that have received significant benefit from investment in Thameslink and Crossrail such as Welwyn Garden City and Brentwood out of South East England. These places are 20 miles from London. They are in The Wider South East by any reasonable definition. Adjusting the calculations which Chris Grayling has used to claim that more money will be spent in the North than the South suggests why this geography was chosen. Using the National Infrastructure Investment Pipeline methodology, projected investment benefitting London and The Wider South East is higher over the projection period (£1060 per head) than in North England (£1039 per head). This isn’t much of a difference, but it is a critical one. Using the data reasonably would not let the Minister make his eye-catching claim. The letter dismisses IPPR North’s work as “unofficial analysis”. This implies its own analysis as “official”. But both analyses are of the National Infrastructure and Construction Pipeline (NICP), a document published with the following clear warning: “The pipeline is based on unaudited administrative data and should not be considered as national statistics or as official statistics”. Neither analysis is more official than the other. In the past, I have defended IPPR North’s analysis based on the NICP. I stand by my defence. But I know that many in the UK government and many of the UK government’s preferred external advisors strongly disagree. “As this table only looks at transport capital spending funded by central government, TfL expenditure is excluded. TfL’s capital programme is funded by a mixture of locally-retained business rates and fare receipts from TfL-operated services, and from 2017/18 onwards it receives no direct central government funding”. The replacement of the TfL Capital Grant with an exactly matched additional retention of business rates required to be spent on capital might make it look like London is funding its own investment, but it is not. It is mostly a cynical decision to get transport investment in London off the accounts to show what the Minister wants to show. It is not a rebalancing of UK government investment. To my knowledge, no other city has been offered this deal, and nor will they be. The separate decision to allow TfL to retain the operating surplus of railways that it runs is more justifiable, but still needs to be kept in mind. I will return to it in section six. Finally, the NICP contains projections subject to change. My suspicion is that, due to the timings of the announcements, some cancellations to Northern electrification remain in the NICP whereas the £500m of extra money to complete Crossrail is absent. Thankfully there is a better way to look at spending on transport, both capital and current. Let’s do that. 3. Country and Regional Analysis. The Country and Regional Analysis dataset from the ONS is part of the national accounts and is collated to higher standards and according to stricter international rules than the NICP. Mistakes in the analysis of this data in the past have not helped in its wide use. In 2017 I secured a correction to analysis from the LSE which significantly understated investment in London and which had been widely used in policy circles for years. Since then I have been encouraging people to use the dataset. In recent years this dataset has become significantly easier to work with and mistakes are less likely to happen again the future. It lets us examine UK government spending, split into current expenditure (operating subsidies) and capital investment (building new infrastructure). 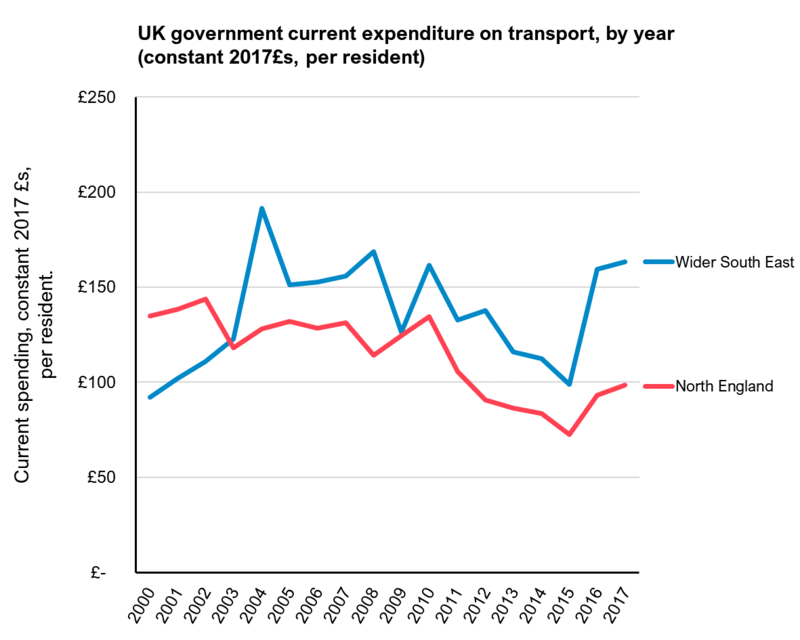 UK government-funded current transport spending per head has been higher in The Wider South East than North England for the past 14 years. 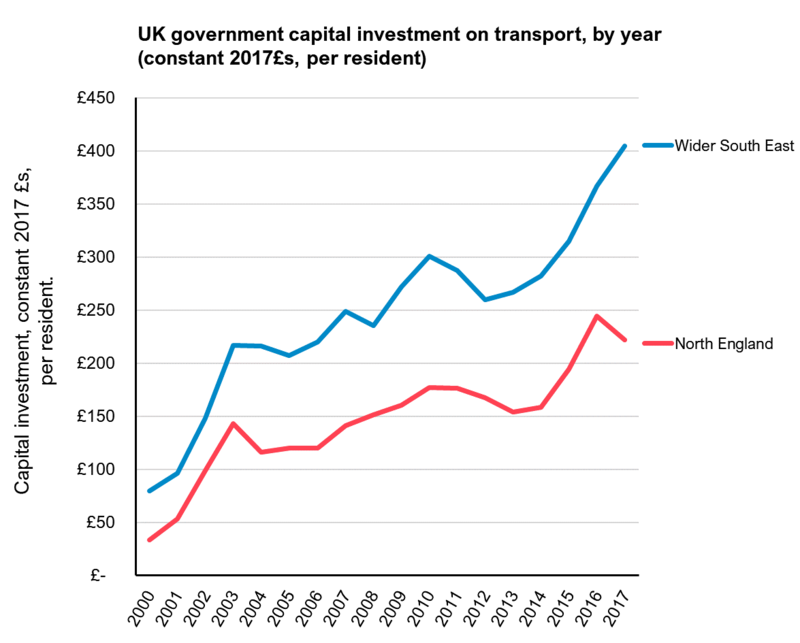 UK government-funded capital transport spending per head has been higher in The Wider South East than North England for the past 18 years. Capital investment accumulates. Tunnels, bridges, stations, rails, and overhead wires last for a long time. For this reason it is important to consider capital investment cumulatively. 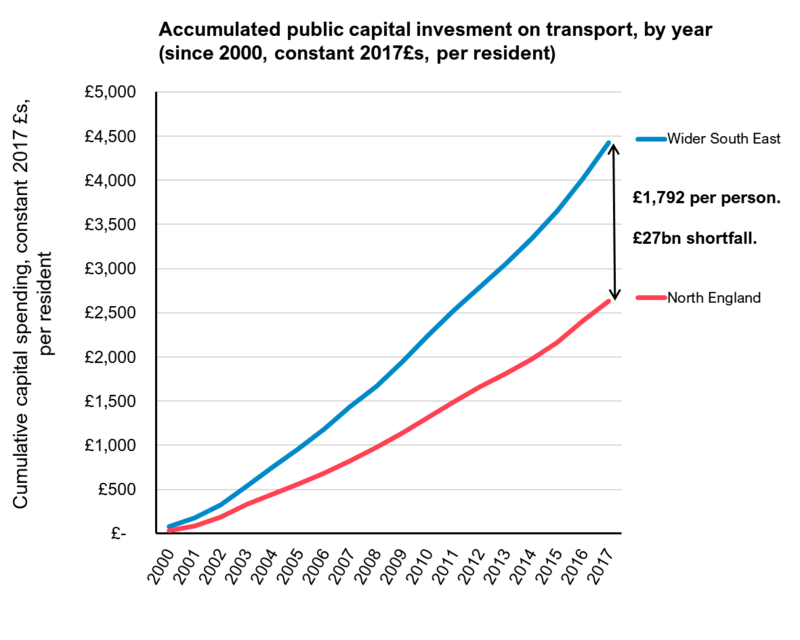 Doing that, we see that if UK government funded capital investment in North England had matched the levels of investment in The Wider South East since 1999 then an additional £27bn of investment would have been made in the North. This is the number that really matters. Things will change in the future. In London and the Wider South East the completion of major UK government funded schemes such as The Thameslink Programme, Crossrail, Waterloo expansion, Great Western electrification and Midland Mainline electrification will mean that capital investment there may well decline. Meanwhile in the North, the continuation of major works for the Northern Hub will probably keep capital spending elevated. If electrification schemes go ahead, capital investment will increase further. There was a reasonable point to make in this data and it is extremely frustrating that the UK government has chosen to exaggerate the narrowing of the UK’s transport investment gap to make an unreasonable one. This was an opportunity for the North to celebrate, and not to moan. That chance has been lost, for now. 5. Regional assignment of investment, and HS2. While we’re moaning, let’s move onto the regional allocation methodology in the NICP and specifically the new notes that have appeared since the UK government started getting annoyed by IPPR North’s work. So far so good. But then the methodology gets sneaky. No it isn’t. And there are very good reasons for this. A big one is that creating a model for the regional benefits of infrastructure investment is really hard, and different models made by reasonable people differ enormously. If we take as an example the Ordsall Chord project in Manchester, 100% of the investment took place in Manchester so it’s easy to assign. But Bradford will benefit from new trains to Manchester airport and Newcastle and Edinburgh will benefit from improved services as a result. Just the obvious benefits of the investment accrue to four regions in a proportion that no two transport economists would agree on. This is why we do spending allocation, not benefits allocation. This is embarrassing. 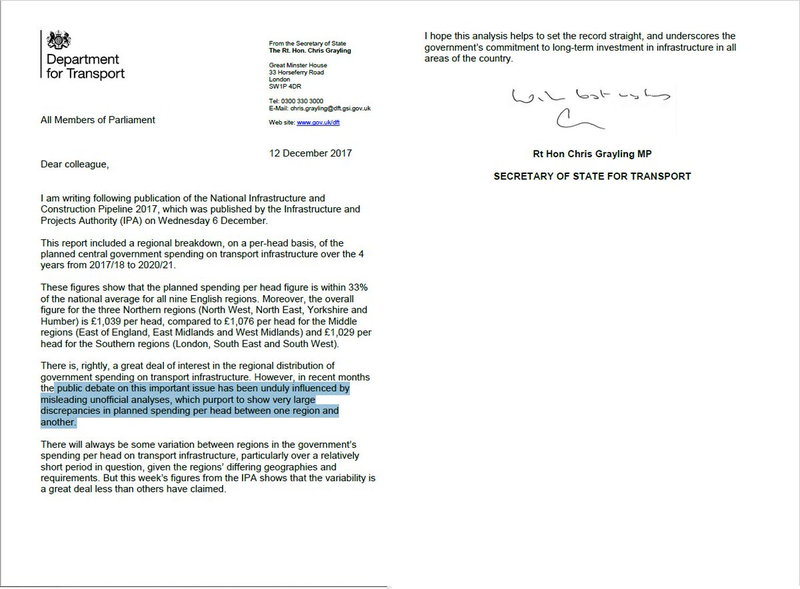 It reads as if the Minister has got so angry with IPPR North’s analysis that he has ordered his team to make investment in London look lower. And they are repeating pretty standard lines of government spin. We always get comments about how “London’s new buses will benefit the whole UK” and how the “Crossrail Supply Chain benefits the whole UK”, and how “London 2012 benefits the whole UK” and how “new tube trains benefit the whole UK” whenever there are large investments in London at the same time as the rest of country sees little investment. This is fine from politicians, but it is embarrassing to see it in government documents. If Liverpool ordered new buses, or Leeds hosted the Olympics, or Sheffield was connected to Manchester with a northern Crossrail these investments would also benefit the whole UK. Since the supply chain benefits of investment are nationally (and internationally) distributed wherever we invest we should not consider them in regional analysis. The argument in favour of more capital investment in North England’s transport infrastructure is that the infrastructure itself will enable additional and faster economic growth. We need the infrastructure investment to be in the North, the supply chain is a separate matter. This should be obvious in Whitehall and Westminster and if it isn’t, we are in deep trouble. Thankfully the team behind the NICP know that they could not get such muddled thinking past The ONS and so they have not been able to quantify the supply chain benefits they mention. It is still worrying that they even mention it. But in one area they have managed to make a change to how the regional allocations of transport investment are performed, and it’s an extremely important one. In the newest version of the NICP, spending of HS2 is assigned to the regions it is modelled to benefit, and not the place where the money is spent. This approach is also being used in the country and regional analysis and in the country and regional analysis 2017: database in Excel format there are assignments of HS2 spending to all regions. This is a huge change. It is very important. I don’t know when this change was made. If there was a consultation on it, I must have missed it. I would have strongly objected if I’d known. This decision means that the huge renovations underway at Euston station, the HS2 tunnels that will be dug under London, the huge new station at Old Oak Common to be shared with Crossrail, the huge landscaping effort and tunnels to avoid inconvenience in the Chilterns, all of this will in significant part be assigned as spending for the North and the West Midlands. Because of this change, the country and regional analysis data has fundamentally changed. It is no longer a dataset of investment in a place, but rather a mix of investment both in and for a place, with proportions decided by models that few can see, many will disagree with, and which are decided in London. I am worried that this is a deliberate attempt to obscure the truth through complication. That undermines public trust in expertise and data. I think that it makes the current revolt against experts rational. It terrifies me, and if what is happening is what it looks like to me, I am deeply disappointed that it is the UK government doing it. I will be investigating this further, and I would welcome any input. But enough of the negativity, let’s move on to something positive — the role of capital investment in creating a self-sustaining transport system. 6. The role of capital investment in creating a self-sustaining transport system. Following decades of large capital investment by the UK government it would be good if London’s public transport system became self-funding and self-sustaining. Almost without exception the aim of UK government transport investment should be to reduce the need for operating subsidies. So far, the data isn’t showing that happening in London, but I suspect that soon it will. One of the best examples of capital investment creating a self-sustaining transport system is Manchester’s Metrolink. Following around £1bn of government investment it now generates an operating surplus of around £10m per year. Another great example is The TransPennine Express rail franchise. There has been considerable investment in and around Manchester, including the Ordsall Chord, a faster route to Liverpool, and electrification to Preston. When combined with new longer trains, and permission to run new lucrative routes such as Liverpool and Manchester to Scotland, the franchise should soon start running at a surplus. The largest example of this is Crossrail. After around £15bn of capital investment — around half coming directly from UK government, and the other half coming from a special business rate supplement in London, not offered to other cities — it will start running at the end of 2019. By taking over existing surplus-generating commuter routes into London and delivering them on larger, more efficient, and faster trains than before, the Elizabeth line is predicted to generate around £300m per year in operating surplus. TfL will keep this operating surplus. They can use it to subsidise other services; trams and buses in London run at a large operating loss. Or they can borrow against it and spend that money on more capital investment. This is similar to what happens with the operating surplus from Manchester’s trams, and there is a strong argument that it should also be what happens with the operating surplus from TransPennine Express, a sum that currently goes to the DfT. Creating a self-sustaining transport system is good. It is good that this is a goal for London and if this is ever achieved the temptation will be to declare London’s transport system as self-funded and tell other cities to fund their own transport systems in the same way. We must push back against this. The £27bn of extra capital investment that London and the wider South East have enjoyed over the past 18 years, and the additional sums before that, are the main reason why it can now self-fund more of its own public transport investment and operation. With the notable exception of Scotland, which controls much more of its own media and institutions, the UK’s national debate on transport investment has for a long time been dreadful. The best we’ve typically got was an IPPR North report being discussed on the BBC in London by a studio full of Londoners who felt that it was unfair to London and London should get more investment. They were often wrong on basic facts, but with no-one to challenge them. And since the London-based Minister could point to a statement prepared by the London-based DfT saying it was all very unfair to London too, that was that. If you think I’m exaggerating watch exactly what I’ve just described on Newsnight from this year. Dig into the archives if you want to see more. This pattern sadly has impacts. Reasonable people believe it. This has always been the case, but thanks to social media we can see it more easily. Here are just two examples, but there are many more. The good news is that things are changing. Thanks to an unlikely combination of social media and Westminster-imposed devolution, combined with a sprinkle of Brexit, the truth is fighting back. Local papers like The Yorkshire Post and The Manchester Evening News can reach national audiences via Facebook and Twitter. Institutions like The Northern Powerhouse Partnership and ODILeeds can convene an alternative discussion. People like me can get the data, analyse it, share our understanding quickly, improve it, and then share it with wider audiences at a much lower cost than in the past. Add to this the newly created Metro Mayors like Andy Burnham and Steve Rotheram who can demand and expect to receive at least some time in the national media and Westminster’s slightly increased interest in regional prosperity as we approach the self-inflicted wound of Brexit, we have a better chance than I’ve known before to improve our decisions on transport funding and investment. Now is our chance to invest properly in the North of England as well as the South East and make up some of the 30% gap between our great cities’ productivity and what we’d expect if they were in Europe. There will be more on this topic soon, but for now I’d welcome comments and corrections. Transport investment is complicated, and with some players deliberately trying to make it more complicated, it is hard to understand. I will have made mistakes. I will be missing things. I welcome corrections, with links.